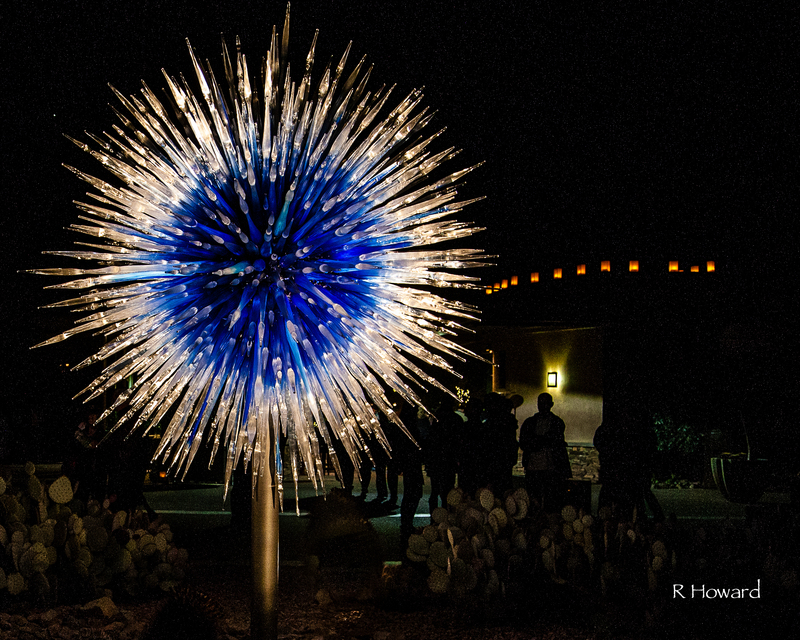 I had a tranquil New Year’s Eve, wandering alone (amidst a crowd of thousands) in the Desert Botanical Gardens. Las Noches de las Luminarias is a beautiful holiday tradition here in the Arizona desert as the gardens are transformed for 31 days by the bright tiny spark of twinkling lights adorning the desert trees and the soft glow from 8,000 hand-lit Luminaria bags lining the walkways. 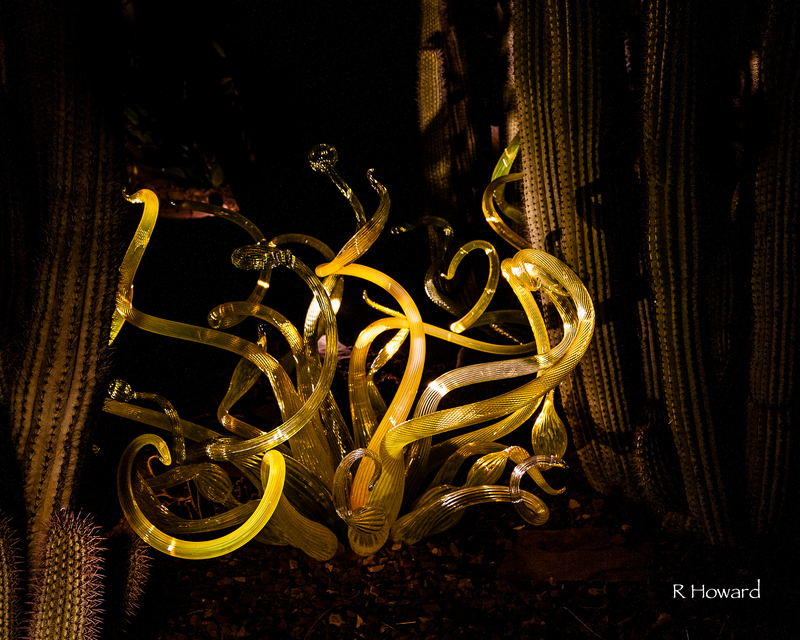 This year, the desert plants were accentuated by the magic of Chihuly glass sculptures. 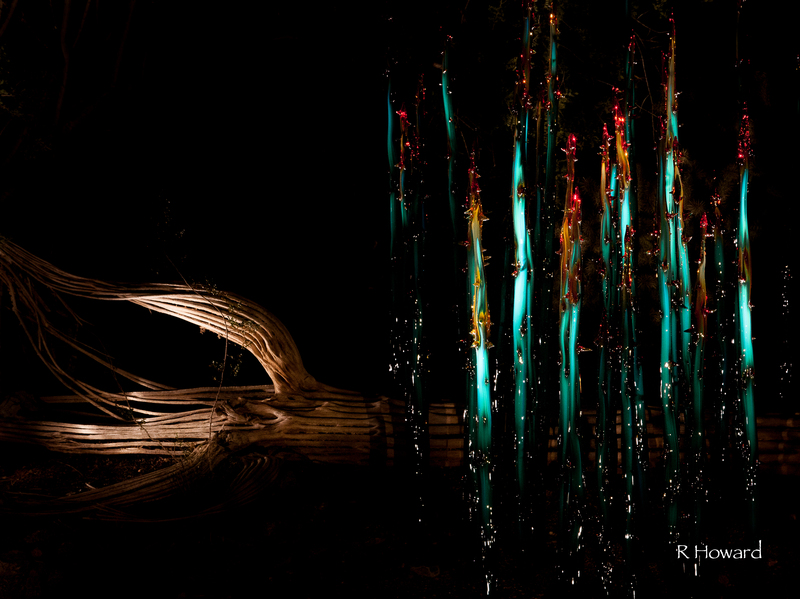 A starburst of blazing blue captures the guests’ attention as they enter the park. I spent a long time with each sculpture, partly because I searched for angles to photograph, but mostly because they are beautiful, whimsical, and fantastical. It was good that I was alone because I would have annoyed anyone with me by my dawdling. I am pretty sure that these pieces represent flowers and cacti (need to do some research), but they feel like snakes…beds of brilliantly beautiful snakes. A well spent New Year’s Eve! Doubt the “dawdling” though….beautiful shots! It was a good evening to wander alone through the gardens. Thank you, Andy. I appreciate your comment. These are beautiful, in this bunch I have two favorites. The first shot is amazing and the orange shot is also fantastic. Great work! Cheers. The first shot is my favorite. It is one I might print. Thank you for following my blog. Wonderful photos Mona. 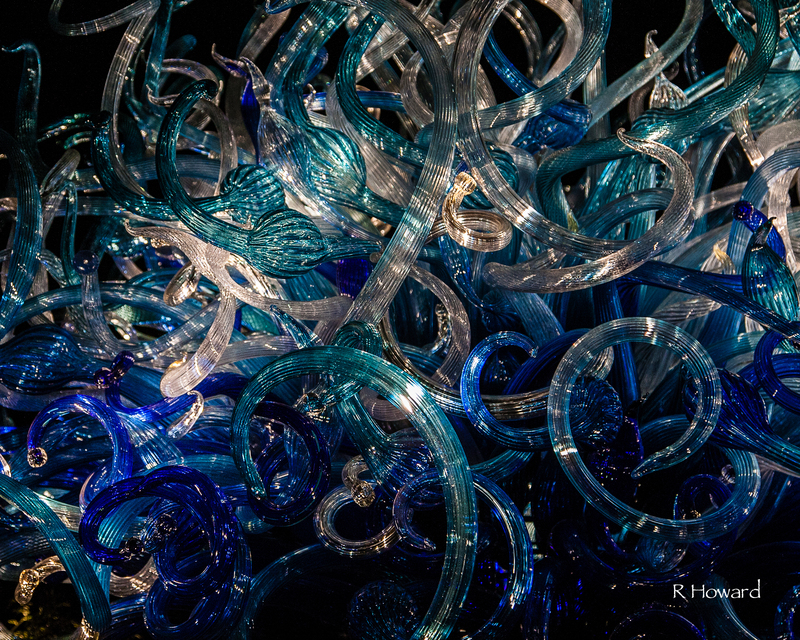 Chihuly exhibits a great fun! Thanks, Tim. I want to go back and get more shots. They were more difficult to photograph than I’d thought they would be. Medusa’s head – blue when she’s cold and sad, red-orange when she’s hot and angry. Oh YES! Medusa … I had not remembered the blue / red-orange connection with her. How perfect. Happy New Year, Inga. I hope that all of your New Year’s dreams come true and that you accomplish all of your goals. Those are gorgeous photos, Ramona. 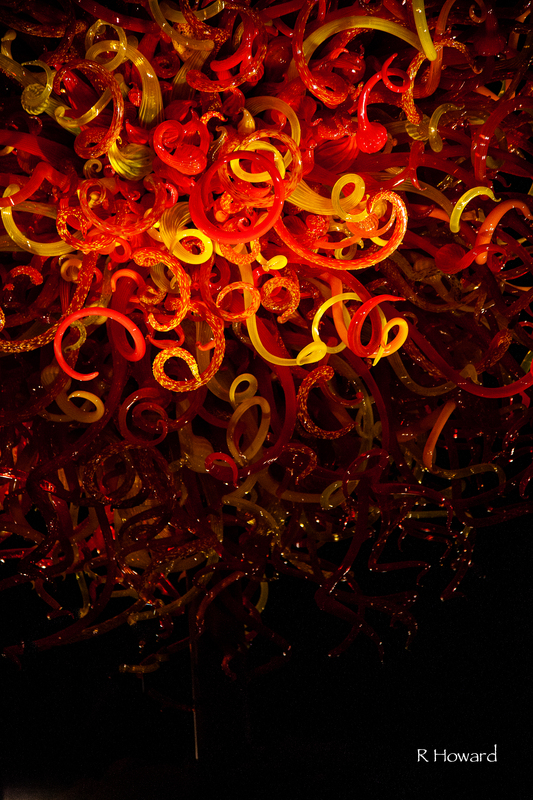 I’ve seen a lot of photos of the Chihuly exhibit but these are the most stunning. I haven’t gone yet, I need to go. This is truly a compliment, Candace. Thank you. Thank you, Amanda. They were more difficult to capture than I’d anticipated. Your comment means a lot to me. Ah Marcus, coming from you this is a great compliment. Wouldn’t it be fantastic to have one of these pieces in your home? I love glass … but have very little in my house … I seem to have collected pottery rather than glass. But aren’t these pieces fantastic? 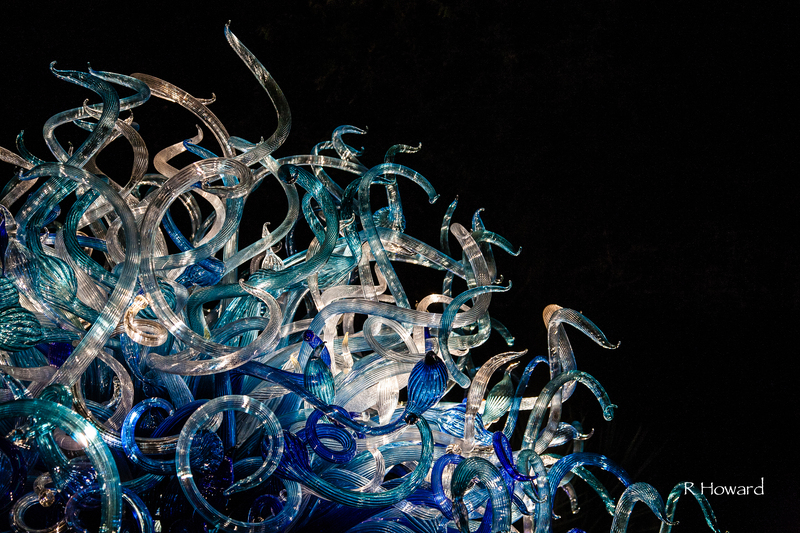 I understand that I saw only a fraction of the pieces at the Gardens and have vowed to return. Yes it would be.. I collected Murano and Blenko art glass. I was really into the vintage – antique art glass from the West Virginia companies that made them in the 50’s. Sadly I stopped due to having children and accumulating too many pieces. I still have not taken some out of the boxes I put them in when we moved to this house 10 years ago lol.. Those pieces are amazing and I always love walking into the glass boutiques. There are quite a few amazing artists out there and the pieces you photographed are lovely.. . I may need another day to email you those tips. I fell asleep early tonight and I just happened to get some water when I saw your response :-). I’ve started it just not finished it yet. Had some questions for you in regards to the location of the e session and the time of day but you will get my email tomorrow. Can never get enough Chilhuly! Thanks for visiting.